Editor's note: This is an installment of Cautionary Tales, an ongoing series about lessons learned the hard way in the Alaska outdoors. Before I reached the top of Backdoor Gap, I knew I had lucked out. I had driven to the Gold Mint Trailhead at Hatcher Pass earlier Sunday afternoon under looming gray skies. My mission: finally completing the Bomber Traverse, a 20-mile loop in the Talkeetna Mountains anchored by a hut system. In a perfect world, I'd be doing the traverse in four days so I could spend a night at each hut on the route. Unfortunately, time constraints meant I'd have to do the traverse as a solo overnight trip. And by the look of the weather, I'd get soggy in the process. When I hit the trail, I was already behind schedule and cursing at myself over a late start. I followed the Little Susitna River valley up to the Mint Hut, owned and maintained by the Mountaineering Club of Alaska. (Staying at their huts requires club membership, which is well worth the annual $20 fee.) The next MCA shelter made more sense as a halfway point on my trip, though, so I pushed forward after a dinner break. A pinpoint of blue sky grew as the thick blanket of clouds dissipated, bolstering my spirits. I worked my way up the scree gully leading to the 5,715-foot Backdoor Gap — a notch in the ridge en route to Penny Royal Glacier, the next step on the traverse — and the weather only improved from there. Before I took that last step, bringing into sight the glacier and valley below, I braced myself for the unknown. And I chuckled in disbelief at what I saw. There lay Penny Royal Glacier, cloaked in a dusky late-night alpenglow. The setting sun was a brilliant orb burning against a muted blue and orange sky. It was a breathtaking moment, the kind that makes me want to simultaneously scream, laugh and dance, bursting at the prospect of endless possibility. I realized then that had I started on time, I would've been stuck in the clouds from earlier. Poor visibility would have obscured my line of sight and complicated navigation. I thought to myself: "If this is what a late start gets me, hell, I'll never be on time again." But while starting late can yield unexpected benefits, the natural consequence is unavoidable: You'll still finish late, of course. That was weighing on my mind as I slowly approached the Bomber Hut, my stop for the night, after 3 a.m. Other hikers told me I'd find their friends at the Bomber that evening, so — hoping this was proper mountain hut etiquette — I knocked on the door, greeted the dog, reassured the occupants ("I'm nice, I promise!") and tried to unstick the Velcro on my gaiters quietly. That was an exercise in futility. I wouldn't have blamed them if they had grumpily kicked me out. Thankfully, though, the pair sleeping at the hut were two of the nicest people I've had the pleasure of meeting in the backcountry, and we shared a few groggy laughs before falling asleep. I asked myself — on that last leg of the trek, dragging my feet along the road in a downpour, I had plenty of time to ask myself questions — would I do it all again? Then I remembered that view at the top of Backdoor Gap. The short answer: Yes. In a heartbeat. Natural avalanche activity is evident up high in the mountains, particularly around Penny Royal, Bomber and Snowbird glaciers on the Bomber Traverse. Late-season snow conditions persist, so avalanche safety precautions and terrain management will be crucial. Glacier travel can be very dangerous: While hazards like the two large moulins on Snowbird Glacier are quite obvious, other dangers are not so visible. I wore crampons for part of the glacier crossings, but snowshoes designed for mountaineering would've been preferred in current conditions. 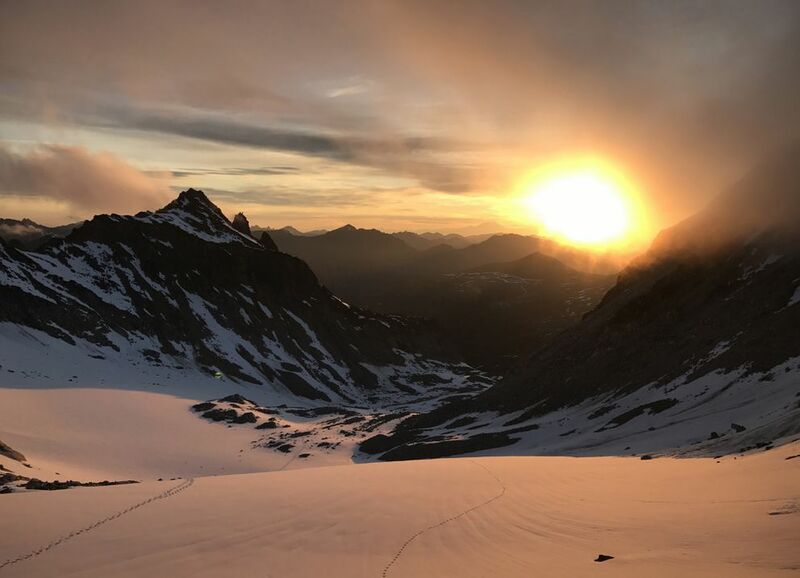 Staying at Mint Hut and Bomber Hut requires membership in the Mountaineering Club of Alaska, which costs $20 per year, while the Snowbird Hut is open to the public courtesy of the American Alpine Club. Follow hut rules and "Leave No Trace" guidelines along the way. Between Backdoor Gap and Snowbird Glacier, if you're looking for a trail, you're out of luck. Navigation is key, and being that far from a road means your margin for error is slim to nil. And as always, remember your bear deterrent and bug dope, on top of your Ten Essentials. Vicky Ho is the night homepage editor at Alaska Dispatch News. An avid hiker and skier, she's also a mediocre runner, terrible biker and part-time employee at a local outdoor retailer. Contact her at vho@alaskadispatch.com, on Twitter @hovicky or Instagram @hovcky.